There are two steps involved in updating Power Manager. Some of you are missing the second step. We need to make updates even easier. Power Manager includes built-in software update support. Every so often Power Manager checks in with Versions to see if an update is available. When an update is available, the next administrator to use your Mac will be prompted to update. You can manually trigger the update check using the menu item: Power Manager.app > Power Manager (menu) > Check for Updates…. What follows is an automated process to update the Power Manager application. The built-in software update downloads, extracts, and swaps over to the latest version. For most software, this is where the update process ends. 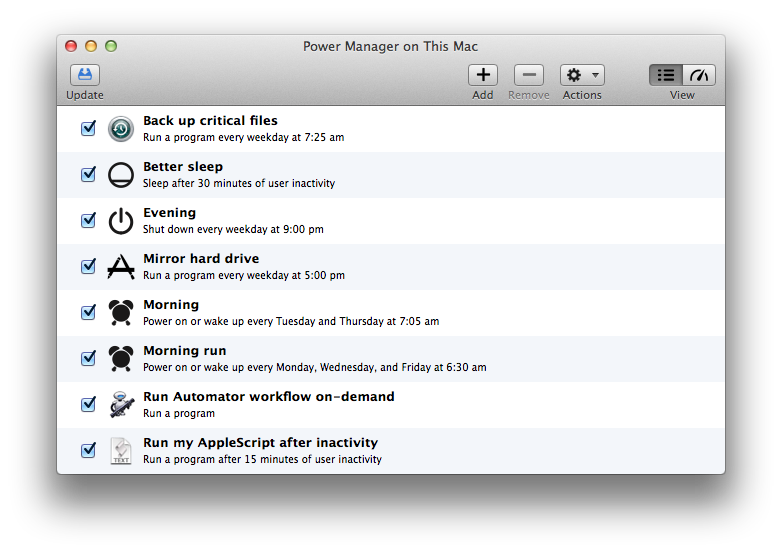 As you might imagine, Power Manager is not most software. Power Manager installs a scheduler to manage and perform your schedule even when you are not running the main application. It is this scheduler that allows your schedule to work even when no-one is logged in. This scheduler also needs updating. This is the second step that you might be overlooking. If the scheduler needs updating, a new blue button appears in the Power Manager application's toolbar. The button is called Update. Clicking this button updates the scheduler and makes sure you are running the latest, most capable, version. We recommend always updating to the latest version of Power Manager. If the Update button is showing in Power Manager, click it. Updating takes just a moment and will ensure you are running the best version of Power Manager available. Select the menu item Power Manager > Check for Updates…. Wait for Power Manager to relaunch. Select Update from the toolbar. Follow the instructions to update the scheduler. Updating Power Manager requires administrator rights and does not require a restart. The next version of Power Manager will improve how future updates are handled. We have dialled back the prompts to update; a new notification will appear much like Apple's own mechanism in the Notification Center. If the scheduler needs updating, the Update button will still appear but now an additional alert will highlight the need to update. This alert can be dismissed for another time – should you not wish to interrupt running events. This article was posted in PM4, Power Manager, and Recipe and tagged software update.